The Beauty of Life: Go Ahead, Smell Me -- I'm Wearing Ban Invisible Solid Deodorant! Go Ahead, Smell Me -- I'm Wearing Ban Invisible Solid Deodorant! Now, I'm all for feeling fresh and clean all day. And how does one accomplish that? By wearing strong deodorant, of course! Normally a Secret gal, this beauty chick recently discovered a new product that may just send Secret running for the hills. Ban Invisible Solid Deodorant in Paradise Winds combines heady florals with the fruity scent of citrus for an intensely invigorating -- yet not too pungent -- aroma guaranteed to make you feel refreshed and oh-so-breezy. But if this scent isn't for you, never fear -- you can try one of the other seven, like Sweet Surrender (a floral and fruity medley), Powder Fresh (decadent vanilla infused with flowery goodness), or Regular (a clean, classic scent everyone will love). I'm even digging the container, with its bright lime-green hue that just jumps out at you when you emerge from the shower. And no deodorant is complete without being invisible as it's rolled on, which -- as you can tell from the name -- this baby is. 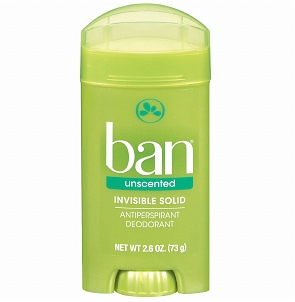 Ban Invisible Solid Deodorant retails for $3.49 at drugstore.com.